Hospitality and table graces have a way of strengthening friendships and building faith. Jesus was no stranger to the table. He received invitations and extended welcome to tax collectors and crowds, sinners and self-righteous, family members and followers. In His final hours with His disciples, Jesus turned the Passover—a Jewish memorial meal—into a foretaste of the messianic Banquet. This act of eating – hospitality and table graces – envisioned a glorious future, where followers of Jesus from every tribe and tongue, age and generation, economic status and denominational bias would dine with King Jesus. Glory, Hallelujah, and Amen. The early church opened her doors, shared her table, and extended welcome to almost anyone. In fact, traveling prophets and apostles relied on the hospitality of their hosts. Only in the case of false teachers and errant prophets does a New Testament author prohibit an open-door policy. And at the center of the first-century church was the Love Feast, a staple in the Christian diet. Sadly, table graces and the act hospitality have gone the way of the telephone booth. The rise of fast food and the demise of the family have contributed. The advance of social media and dearth of intimate friendships have contributed. Individualism, busyness, and gluten-free-dairy-free-all-organic diets have contributed. (We could probably blame global warming and the government, too, but time and font space are limited.) All causes aside, the hospitality gap is glaring; the craving for spiritual community is great. In recent years, several authors have rediscovered this ancient virtue. Their writings are worth considering for fuller treatment on the topic. Below are three personal blessings I have reaped from hospitality and table graces. Perhaps they can serve to inspire a resurrection of shared meals in Jesus’ name. A mini-fridge secured my salvation. My friends’ parents kept a hearty stock of Coke products and canned beverages in their basement. The neighborhood youth flocked to their house for refreshments; they stayed to play Skee Ball. My neighbors’ rich hospitality opened the door to faith conversations. My own suburban home boasted neither soda pop nor Christian faith. We were nominal, moral suburbanites, plucking from the seasonal offerings (aka, Easter and Christmas) of Grace Polaris Church. Living Christmas Trees and Pastor Jim (Custer) homilies touched my ears twice a year. My heart and stomach were left unaffected. It was the mini-fridge that lured me into Christian community. Invitations to “come and play” Skee Ball evolved into opportunities to “come and see” Jesus. As a kid, I joined my friends’ family for VBS. As a teen, I joined their family for youth group. Before long I regularly attended their Sunday morning worship services as their surrogate son. After service, I tagged along for Sunday lunch. My seat at the table reinforced my footing in the spiritual family. I have never forgotten this lesson of hospitality. In 15 years of marriage, my wife and I have shared the table with many a surrogate. We endured two years of communal living with friends and kin—an experiment that would have benefited from more shared meals. We welcomed in a young lady from our church who spent a year transitioning from a difficult job to a promising marriage. These living arrangements made a mess of the kitchen, but enriched our relations. From meal preparation-and-prayer to meal consumption-and-cleanup, hospitality embodies relational sacrifice and intimate care. Whether the host makes a favorite dish, new recipe, or simply serves desserts, the invitation into a home is far more personal than a vinyl booth at a local dive or diner. “Make yourself at home” warms the orphaned heart. Hospitality blesses the lost and lonely. Each of us could identify a co-worker, neighbor, or fellow Christian who has not received an invitation to a home for months. We should be far more eager to extend our call to the dinner table. I also learned how hospitality and table graces can take place outside the home. Ironically, this lesson came during a two-year sojourn in the house church movement. Ed Waken, founder of Valley Life Church, a network of organic churches in Phoenix, tutored me and my wife in evangelism, disciple-making, and simple church. The day our moving truck arrived from its three-day trek, Ed assembled a team to unload our belongings. He capped his warm welcome with a gift basket of fresh fruits and yogurt. Liz and I quickly integrated into Valley Life family. We became surrogates in various homes, but also benefited from the weekly, Sunday night gathering of network churches. Following a time of singing, sharing, and responding to God’s Word, Ed extended a standing invitation to all who gathered to caravan to a local restaurant. Dinner was a continuation of worship. Not everyone came, but a steady group of 15 to 20 always prolonged their fellowship. The regulars made a point to welcome any new face or uncommon guest. Conversation bounced from church to film to work to family life. Ed never hesitated to ask someone what God had been teaching them. Standing invitations provide a security blanket against excuses. For those too busy to attend this week, future Sundays are always an option. For those too worried to open their home or invite a stranger, the group gathering provides a third place with plenty of people. 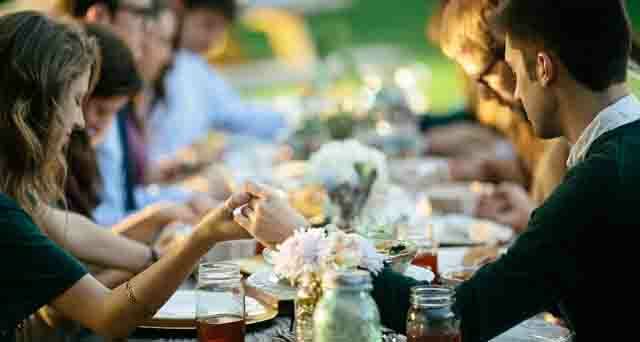 For those grousing about their lack of connection or looking for deeper friendships, the standing invitation saves a seat at the table. Churches and individuals vary in their modes of standing invitation. Our church has used fifth Sunday potlucks; others carry-in meals every week. Some congregations plan a meal for newcomers, either on-site or in homes. I have visited churches that provide food prior to midweek services. Additionally, I know many couples who open their home to young adults for Sunday dinner, Monday Night Football, or weekly soup supper. God made our friend Nicole to cook. She routinely checks out cook books from the library. She regularly invites friends to her house to celebrate their birthdays. She breaks out wine glasses, chargers, and China. Meals at her home are a feast. Several years ago, Nicole noticed the feasting theme in Scripture. Jewish people were accustomed to celebratory eating. Be it Passover or Purim or Succoth (the seven-day, harvest festival in booths), Jews ceased from their labor and started to gorge. They came from all directions to the Jewish temple. They sang Psalms of deliverance along the way. Jewish feasts reflected on God’s past faithfulness and looked forward to His promised blessing. Nicole grew up observing the Love Feast as part of her Communion liturgy. Sadly, sometimes Threefold Communion feels more solemn than celebratory; more mechanical than Messianic. Pulling from the dusty pages of Esther, Nicole latched onto the phrase: “Sorrow turned into joy and their mourning into a day of celebration.” She planned a “day of celebration” coinciding with Easter season. Dubbed the Resurrection Party, she invited church members, family, neighbors, and friends to feast. The Resurrection Party celebrates life. We eat delicious food, sing hopeful songs, share reflective readings, count our blessings, and rehearse for the glorious return of Jesus. Such a banquet as this fills my belly and fuels my hope. While the Resurrection Party is an elaborate undertaking, it serves as an annual reminder of the sacrament of hospitality. Eugene Peterson argues for the sacred aspect of every meal: “Hospitality is daily practice in keeping sacrifice local and immediate; a meal prepared and served to family and guests is giving up ourselves for another.” To practice hospitality—open our homes, share our goods, prepare-serve-and-clean up afterward—is a small sacrifice modeled after the great sacrifice of Jesus. Editor’s Note: Tim Sprankle is pastor of Grace Brethren Church, Leesburg, Ind. He also serves as chair of the board of directors of the Brethren Missionary Herald Company, the parent organization of GraceConnect. Jesus fed crowds (Mark 6:33-44; 8:1-10) and reclined with tax collectors (Mark 2:14-17), Simon the Pharisee (Luke 7:36-50), Simon the Leper (Mark 14:3-9), Martha and Mary (Luke 10:38-42), Zaccheus (Luke 19:1-10) and his disciples (Mark 1:29-34; 2:18-28; 7:1-13; 14:17-25). 1 Corinthians 11:17-34. The passage mostly details the Bread and Cup, but ends with directions on communal eating, likely implying the Love Feast. See Eugene Peterson, Christ Plays in Ten Thousand Places (Grand Rapids: Eerdmans, 2005), pp. 212-222; Barry Corey, Love, Kindness (Carol Stream, IL: Tyndale House, 2016), pp. 157-171; C. Christopher Smith and John Pattison, Slow Church (Downers Grove, IL: IVP Books, 2014), pp. 192-222; David Kinnaman and Gabe Lyons, Good Faith (Grand Rapids: Baker Books, 2016), pp. 129-139. My father professed Jesus, but did not see this decision spread to his family. For reference, I use “house church,” “simple church” and “organic church” synonymously. See article about Clancy and Sandy Cruise from Marysville Grace in this issue. 1 Corinthians 11:26, NASB (emphasis added).